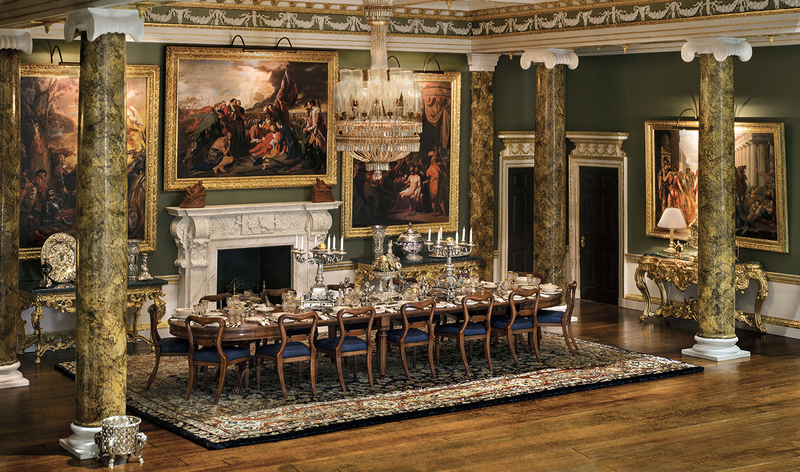 The Painted Room of Spencer House, Princess Di’s ancestral home. 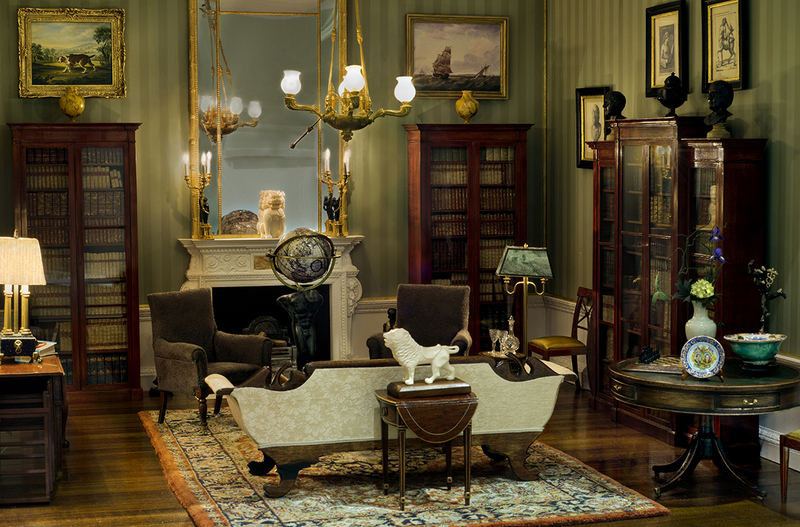 The 1/12-scale mansion resides in the KSB Miniatures Collection. In 1772, writer Arthur Young said of Spencer House in London, “I know not in England a more beautiful piece of architecture … superior to any house I have seen.” I agree wholeheartedly and only wish that I, like Young, could have visited Princess Diana’s ancestral home in its pristine original state. Later, when the home was restored to its grandeur and published in Joseph Friedman’s Spencer House: Chronicle of a Great London Mansion, I thought of Young’s statement again. I agreed then, too, and that was the moment I knew I wanted to commission a miniature inspired by the beloved British structure. I adored the beauty of its architecture and the fact that it was designed by two different architects who managed to combine their styles so successfully. One of the things that impresses me the most about this house is that the State Rooms are very grand with their hand-carved, hand-painted ceilings and the 180 sheets of 23.5K gold leafing used to decorate the architectural details. And they flow so easily into the rooms that are less formal, making all of them very welcoming. It truly is one of the most beautiful and well-appointed combinations of hominess and opulence in this period of homes—the last standing of the great London mansions. I’m proud to give you a small tour of some of its rooms in miniature. 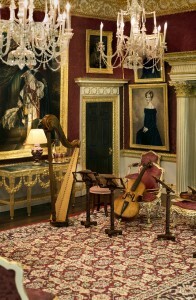 The Painted Room, above and at left, is an elegantly painted room signifying love and marriage, fidelity, art and music. It features art and architecture from Greece, Rome, Renaissance Italy and 17th century Flanders. When I lived in Naples, Italy, I was able to travel to those areas and fell in love with everything about them … the food, the relaxed atmosphere, and most of all the history and beauty of the architecture. The Painted Room represents all of these things to me. For instance, the original decorative theme by James ‘Athenian’ Stuart is based on his travels to Pompeii, Herculaneum and ancient Rome. The painting in the fireplace surround is The Aldobrandini Wedding, a wonderful example of classical paintings of the time. To me, the room is filled with symbolism, allegory and metaphors taken from gods and goddesses of Greek mythology. It’s all about love and where love is, art and music are found. Scenes of wifely virtues, cherubs, wine and dancing are also captured. 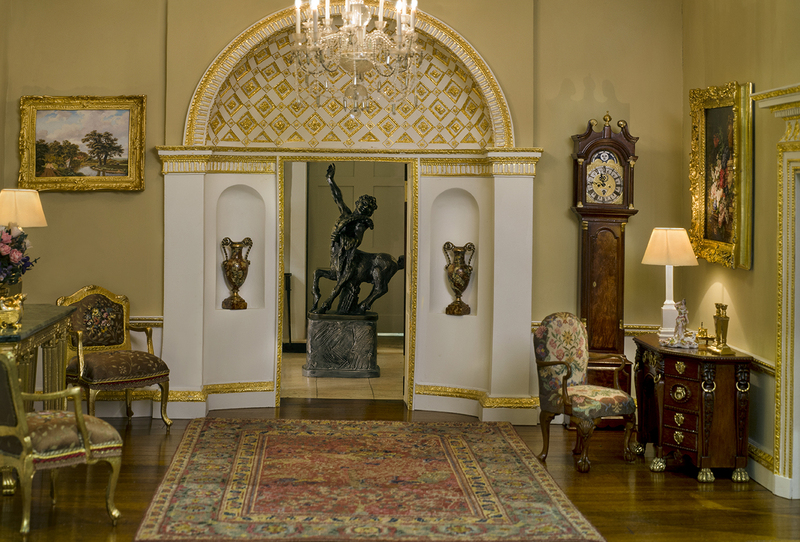 I call this particular area of the Great Room “Diana’s Corner,” as her portrait painted by John Hodgson resides there under the portrait of her brother, Charles, the Ninth Earl of Spencer. 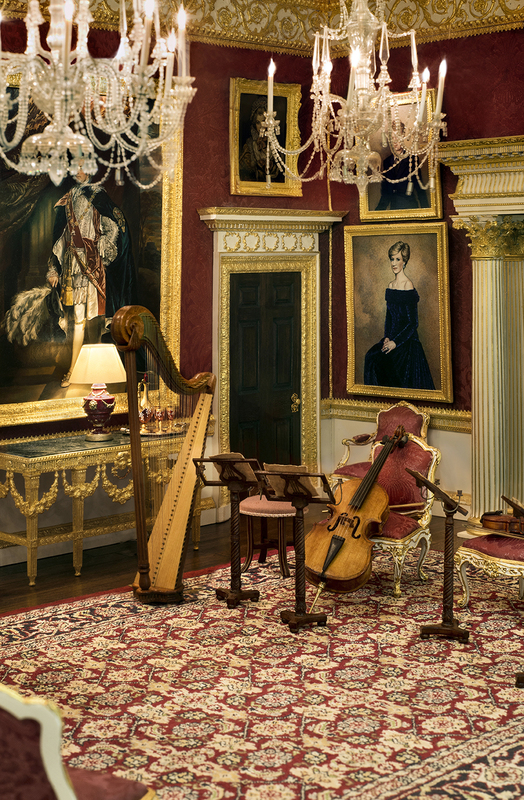 Also pictured in the photo are stringed musical instruments, a harp by French miniaturist Pierre Mourey and cello by W. Foster Tracy which can be tuned and played, that is, if the musician had 1/12th-scale fingers! The amazing workmanship of these instruments is beyond the imagination. 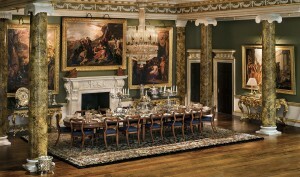 The Great Room also houses a wonderful collection of miniature oils of the Earls of Spencer leading up to Diana’s brother. The Ante Room is one of my favorites because of what it represents. It is where guests would have been greeted and it just seems so inviting. The apse over the door is based on the one on the Temple of Venus & Rome and signifies a triumphal arch. 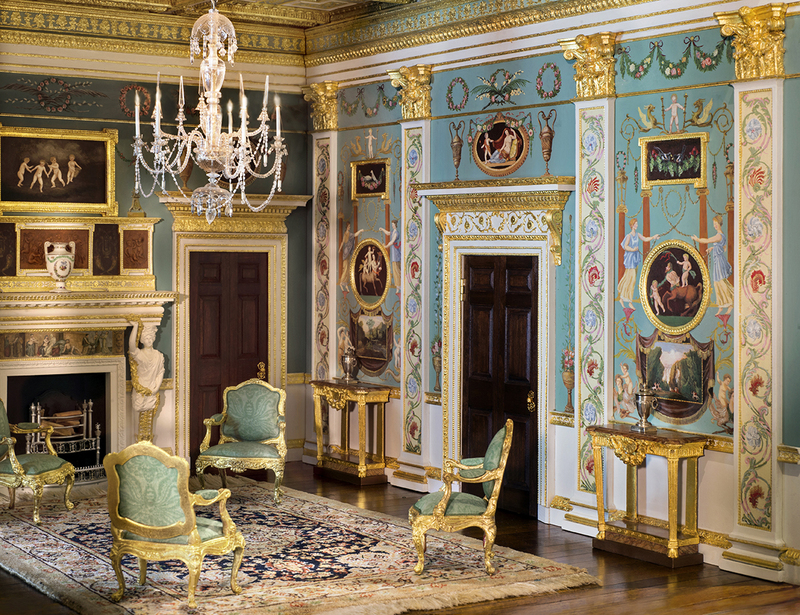 The desk and sideboard in this room are both exact replicas of original furniture in Spencer House. The working grandfather clock and chair are hand-carved by John Hodgson and the petit-point on the desk chair is by Sue Bakker, a founding member of the Guild of Miniature Needle Arts. It is a very special piece in the collection. 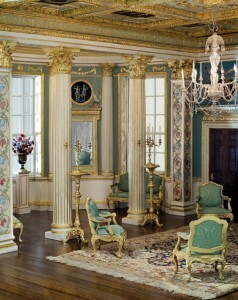 The Library is the most comfortable and warm room in Spencer House and is decorated with replicas of furniture existing in Spencer House today. I added another work by Mourey to this room, the working terrestrial globe. It shows the continents with meridians and parallels and is being held by a bronze statue which suggests that man is carrying the weight of the world on his shoulders. The original one, dating from 1778, resides in the library at the Palace of Versailles. Some of my favorite features of this room are the Christian lithographs on the walls. The Dining Room is ready for entertaining as you can see, somewhat like a scene out of Downton Abbey. Remember the show’s episode where the Crawley family spent time in their London townhouse and Rose was presented to King George V and Queen Mary? These types of events were part of the purpose of the large London mansions—used when the Dukes and Earls and their families would come to the city for the social season. 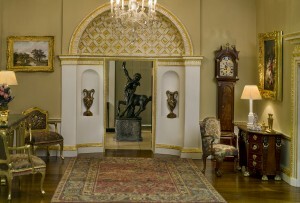 It is a bygone era, and I’m so pleased to have captured some of the essence of that period in Spencer House. This year marks the 25th anniversary of the restoration of the iconic English mansion. I was honored to be asked to display the miniature Spencer House there for the celebration, but being the cornerstone of the gallery collection, it would have left a huge void. I was, however, able to send them the next best thing, a video on the making of Spencer House, which includes an interview with the makers, Kevin Mulvany and Susan Rogers. This is such a special time for Spencer House and I am grateful that I could be a part of celebrating this amazing historical structure both here and across the pond. See the real Spencer House here. My husband and I visited the museum this past Wednesday, everything was beautiful!